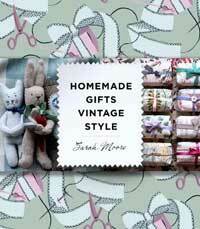 In her book Homemade Gifts Vintage Style, Sarah Moore provides inspiring ideas for vintage gifts, from teacup candles to Christmas stockings. There is something really special about hanging out stockings at Christmas time, and one that is roomy enough for the most wished-for present makes a great gift in itself. You will need quite a large piece of thick woollen fabric, so an old blanket is perfect. Choose a plaid picnic rug, complete with tassels, or a thick bed blanket, often found with a satin ribbon edging. You can make these special stockings as simple or as fancy as you like. Adding initials or names is both decorative and always good for avoiding any confusion in the early hours of Christmas morning, or you can just use a simple bauble design or pocket to embellish the stocking . 1. Start by making a template: have a look at the stocking in the picture, or copy one that you have already. Draw it out freehand on a piece of newspaper or, alternatively, draw around the biggest pair of Wellington boots that you have in the house and then add quite a few centimetres all around. Cut out the shape. 2. Blankets are perfect for this project as they have a helpful finished edge already. If the blanket is different on the front and the back, place it right-side down. Pin the top of the stocking template along the fringed or finished edge of the blanket and chalk around it to make the sewing line. Remove the template and cut out the stocking shape about 2cm outside that line. Turn the template over, chalk a mirror image of the stocking shape on the blanket and cut it out in the same way. 3. 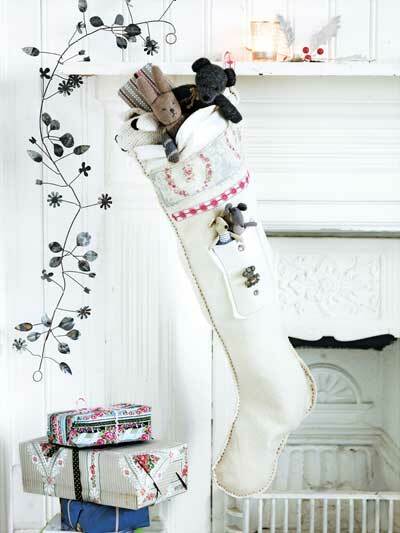 If you want to add appliqué decorations to the stockings, now is the time to sew them on. Simplicity is best, so choose strong Christmas shapes such as baubles or gifts, or the stocking recipient’s initials or name, and cut them from vintage fabrics or felted wool. Or cut pocket shapes from more of the blanket and sew them to the stocking to hold extra-special little presents. 4. Pin the appliqués in place, ensuring they do not stray over the sewing line or they will disappear into the seam. Either handsew all around the edges with blanket stitch, or machine-sew them on using the zigzag setting. 5. When you have finished the appliqué, place the stocking shapes right sides together, making sure that the fringed or ribbon edged tops are level with each other. Pin the stockings together and then sew all around the chalk sewing line using backstitch. 6. Turn the stocking right side out and trim off any excess seam allowance. You need to add a loop of ribbon to the top so that it can be hung up. Press open the back seam at the top of the stocking with a warm iron. Pin the ends of the ribbon loop across the seam allowances and sew them in place using backstitch on the machine or some good, strong handstitches. 7. You can sew a pompom to the tip of the stocking toe, and sequins, buttons and trims to the top edge if you have used fabric without a finished border, or just want to add a bit more sparkle. Is your office desk a haven for germs?